Department of Health Science, University of Milano Bicocca, Via Cadore, 48; 20900 Monza (Italy). This study analyzed the time dependence decay of the mRNA of selected genes important for the hypoxia response. The genes chosen were the two isoforms of hypoxia-inducible factors, the three isoforms of the prolyl hydroxylase domain protein, the vascular endothelial growth factor and endothelial nitric oxide synthase. mRNA and proteins were extracted from lungs obtained from control, hypoxic and 15 minutes normoxic recovered rats and analyzed by Real-time RT-PCR or by the Western Blot technique. Results indicated that in normoxia isoform 2á was the more represented hypoxia-inducible factor mRNA, and among the prolyl hydroxylase domain transcripts, isoform 3 was the least abundant. Moreover, in chronic hypoxia only hypoxia-inducible factor 1α and prolyl hydroxylase domain protein 3 increased significantly, while after 15 minutes of recovery all the mRNAs tested were decreased except endothelial nitric oxide synthase mRNA. In terms of proteins, hypoxia-inducible 1α was the isoform more significant in the nucleus, while 2á predominated in the cytosol. While the former was steady even after a brief recovery from hypoxia, the latter underwent a strong degradation. In conclusion we showed the relevance of the decay in the mRNA and protein levels upon re-oxygenation in normoxia. We believe that this has to be considered in research studies dealing with recovery from hypoxia. Key terms: chronic hypoxia, Hypoxia-inducible Factor, Prolyl Hydroxylase Domain proteins, lung, RT-PCR. It is well established that upon hypoxia exposure, the difference in oxygen tension induces the expression of several genes in order to guarantee an adequate response of the living system to the environmental changes and to maintain organ homeostasis as much as possible. In this scenario, the master genes to be considered are the Hypoxia-Inducible Factor (HIF) 1 and 2 (Jiang, 1996) as well as the Prolyl Hydroxylase Domain (PHD) proteins 1, 2 and 3 that, besides their contribution to the regulation of HIFs (Appelhoff, 2004) serve also as oxygen sensors (Fong and Takeda 2008). Several studies have already addressed in depth the kinetics of the onset of the hypoxia-dependent response in terms of increase in the level of HIFs, mRNA and protein (Chamboredona, 2011). On the other hand, only few papers were dedicated to the time dependent decay after recovery from hypoxia, a condition that also represents a change in oxygen tension. In in vivo studies, the protein expression level of HIFte was halved after 5 minutes of re-oxygenation and reached the normoxic level in 60 minutes or even less (Yu, 1998; Stroka, 2001). With regard to mRNA in aquatic organisms such as mantis shrimp and croaker, the level of HIFte remains stable for 3 hours of normoxic recovery from hypoxia and declines after 24 hours of normoxic condition (Kodama, 2012; Rahman, 2007). Chronic hypoxia is common to many disease conditions that share, as a joint feature, an insufficient tissue perfusion. In the lung, prolonged exposure to a low level of oxygen results in a general alteration that culminates in pulmonary arterial hypertension (Rivolta, 2011), a clinical condition that includes a remodeling in the pulmonary vasculature as well as cardiac complications. In this case, in addition to HIFs and PHDs, other two important genes to be considered are those encoding for Endothelial Nitric Oxide Synthase (eNOS, or NOS3) and Vascular Endothelial Growth Factor (VEGF-A, hereinafter VEGF); with their activity, these genes balance the constriction or the dilation of pulmonary vessels and the need for neo-angiogenesis. Due to the clinical relevance of the problem, we believe that a picture of the molecular level of these selected, but crucial, players in the overall lung tissue at the peak of the chronic hypoxia exposure period is missing. Moreover, we also found relevant to investigate the kinetic tissue response in the first minutes of re-oxygenation. If it is proven that the half-life of the proteins involved is in the order of minutes (Yu, 1998), we think that also mRNA decay should be studied in this time range. In this paper, our challenge is to obtain a "frozen picture", as precise as possible, of the level of few selected mRNAs and proteins in the whole lung at the very end of the chronic hypoxia exposure and after few minutes of normoxia recovery, and to interpret it in the light of the physiological response of the lungs. Nine male, 5-week-old Wistar rats, weighing 100-125 g (Charler River laboratory, Italy) were randomly assigned to one of the following two groups: a control group (CTRL, n=3) and a hypoxic group (HYP, n=6). The hypoxic group was exposed for one month to normobaric hypoxia (10% O2) as previously described (Rivolta, 2011). For each group, one rat was housed in each cage with free access to standard rat chow and tap water and a 12 hour light:dark cycle. All animal experimentation was performed according to the Care and Use of Laboratory Animals, endorsed by the American Physiological Society. The hypoxic and control rats were sacrificed by cervical dislocation without anesthesia; the chest was opened and the lungs immediately removed. Tissue samples were washed in ice-cold physiological buffer, frozen in liquid nitrogen and stored at -80 °C in order to avoid RNA degradation. The entire procedure was completed in 5 minutes from the removal of the animals from the cage, as this was the shortest time compatible with the procedure. For the HYP group, three animals were sacrificed immediately after the end of the hypoxia (also in this case the procedure was completed in 5 minutes, in the text will be indicated as HYP5); three other animals were first allowed to recover for 10 minutes (HYP15) in normoxia. 1ml of Trizol Reagent (Invitrogen) was added to 50-60mg of frozen lung samples and the suspension was homogenized on ice, in order to not damage and to preserve the samples from degradation. Once the tissue was completely homogenized, 0. 2 ml of chloroform/1ml of TRIZOL was added, shaken by hand for ten seconds and maintained on ice for 2 minutes. The samples were centrifuged at 1200xg for 15 minutes at 4 °C: the aqueous phase that contained RNA was removed and transferred to a new tube with 0.5 ml of isopropanol. After 10 minutes at 4 °C, samples were centrifuged at 12000xg for 10 minutes at 4 °C. The RNA formed a gel-like pellet on the side and bottom of the tube. The supernatant was removed and the RNA pellet washed with 0.5 ml of 70% ethanol. After re-suspension of the pellet, the tube was centrifuged at 7500xg for 10 minutes at 4 °C, the supernatant removed and the RNA pellet dried in air for 5 minutes. The RNA re-suspended in RNase-free-water (20-50μl, depending on the amount of the RNA pellet) and incubated at 55 °C for 5 minutes was then stored at -80 °C. The concentration of RNA in each sample was determined by reading the absorbance of 1μl of each sample with a NANODROP Spectrophotometer (Thermo Fisher). The RNA integrity was assessed by electrophoresis, running of nucleic acid on agarose gel. To avoid any DNA contamination, 2μg of RNA were treated with DNase I (Fermentas) according to the manufacturer's protocol. At the end of protocol, samples can be directly used for reverse transcriptase or stored at -80 °C. The reverse transcriptase reaction was performed according the protocol of the SuperScript III First-Strand Synthesis SuperMix (Invitrogen) by using 2 μg RNA previously treated with DNase 1, a reverse transcriptase enzyme (Invitrogen), random hexamers as primers, dNTPs and an RNase inhibitor. The resulting cDNA can be directly used for the Real Time PCR or stored at -20 °C. Negative controls included samples without RT enzyme and samples in which total RNA was replaced with ddH2O. Quantitative PCR was performed using the Line-gene K Real-time PCR Detection System (Bioer) with the use of SYBR Green I Premix Ex Taq (TaKara). Specific primers for rat HIFla, HIFla (o EPAS1), PHD1 (o EGLN2), PHD2 (o EGLN1), PHD3 (o EGLN3), VEGFA, eNOS (or NOS3) andl 8S were designed according to the reported sequences (Table I) using the ProbeFinder Software (Roche). For calculation of threshold cycle (Ct), an efficiency curve was generated using 10-fold dilutions of a randomly chosen cDNA lung sample. These curves were considered acceptable if a difference of 3.3± 0.3 cycles was demonstrated between each of the 10-fold dilutions and the correlation coefficient of all different sequences was at least 0.99. Reactions were performed in triplicate, and the negative controls derived from reverse transcription were included in each run. The reaction protocol included an initial step of 20 sec at 95 °C to activate the polymerase. Each PCR cycle involved denaturation (95 °C, 30 sec), annealing (60 °C, 30 sec) and extension (72 °C, 20 sec). Fluorescence was measured after each cycle. A melting curve analysis (Amplicon Tm, shown in Table 1), was obtained by increasing the temperature by 0.3 °C every 10 sec, from 60 °C to 96 °C, and was used to identify a temperature at which only the amplicon and not primer dimers accounted for the SYBR. Green-bound fluorescence. The relative fold change of expression of the transcripts of target genes was quantified as 2-(ΔCt), where ΔCt was Ct (target genes) - Ct (housekeeping gene) (Pfaffl, 2006). We selected as housekeeping gene 18S rRNA. 40 mg of each sample of lung tissue were homogenized with a glass/glass homogenizer, and nuclear and cytosolic proteins were separately extracted using a commercially available kit (NE-PER Nuclear and Cytoplasmic extraction reagent, Pierce) according to manufacturer's protocol. The protein concentration was assessed using a BCA Protein Assay Kit (Pierce), and Bovine Serum Albumin (BSA) was used for a standard curve. 2 μl of each sample were tested to quantify the protein content. Proteins were preserved at -80 °C for Western Blot assays. ImageQuant LAS400 (Ge Healthcare) system. ImageQuant TL software was used for the semi-quantitative analysis of the results, normalizing the values expressed in arbitrary units detected for each protein with respect to the values obtained for α-Tubulin or lamin A. Statistical analysis of the results obtained from the Real Time-PCR analysis of HIFte and HIF2α; in control condition was carried out by unpaired two-tailed Student t tests and the significance level was set at p<0.01. For intergroup comparison (CTRL, HYP5 and HYP15 conditions), the results obtained from Real Time-PCR and Western Blot analysis were tested using one-way ANOVA and the differences were analyzed with post-hoc Bonferroni tests. The significance level was set at p<0.01. Data are expressed as the ratio of the hypoxic compared to the normoxic control conditions. In this study we relied on a well-known chronic hypoxic animal model (Rivolta, 2011), in which rats exposed to 10% O2 for four weeks showed a decrease in food and water intake compared to rats maintained in normoxia. This behavior may be related to the reduced homeostatic needs of the animals and to the onset of reduced aerobic metabolic activity (Singh, 1993), seeing that the hypoxic animals moved less than normoxic ones. We previously characterized several functional parameters and in this paper we focused our attention on selected molecular hypoxia targets in the lungs. Hypoxia response takes place starting from specific characteristics of the tissue in control condition (Heiner, 2010). Here we are interested in studying the response of seven selected genes, HIFte, HIF2^ PHD1, PHD2, PHD3, VEGF and eNOS, that are expressed in the lung and that are sensitive to chronic hypoxia. In order to provide a profile pattern of mRNA expression of our selected genes, we performed real time PCR on mRNAs that were rapidly extracted from normoxic whole rat lung specimens and immediately frozen in liquid nitrogen. The relative amount of each transcript was calculated as 2-Δ (Ct) using 18S rRNA as housekeeping gene. It is now well established that 18S rRNA is less sensitive to the effect of hypoxia compared to other housekeeping genes (Nagelkerke, 2010), thus its level of expression is more constant. In order to compare the target protein level with the mRNA expression found, from the lung of the same animal we obtained the total tissue lysate subdivided into nuclear and cytosolic fractions. We evaluated the protein level of HIFs, VEGF and phospho-eNOS, the functional form of the protein. As shown in the histogram in Figure 1A, in normoxic condition HIF2α; mRNA was about 13-fold more represented in the lung (29.25±5.4) than HIFte (2.24±0.38, p<0.01). Interestingly, considering the protein level in the nuclear lysate fraction normalized to lamin A (Fig. 1B), HIFte was 5.7-fold more abundant then HIF2α; (1.6±0.5 vs. 0.28±0.09, respectively). The situation was reversed in the cytosol, where a prevalence of HIF2α; on 1α protein (Fig. 1B) was seen. In particular, for HIF2α; the ratio cytosol/nuclear fraction was 17, revealing a greater amount of the protein in the cytosolic compartment. HIFte protein in the cytosol was detected at a very low level with a cytosol/nucleus ratio as low as 0.06. Figure 1. Expression profile of selected transcripts and proteins in the normoxic rat lung. Panel A. The histogram shows on the y axis the relative expression quantified as '2-ΔCt, of each transcript, where 18S rRNA was used as housekeeping gene. In all the experiments n=3 and each sample was tested in triplicate. Data are presented as mean±SD. The symbol * indicates a significant difference (p<0.01) among the isoforms. Panel B. Representative Western blot analyses of HIF1α (left) and HIF2α (right) protein expression in the normoxic lungs. Immunoblots of cytosolic or nuclear extract (30 μg/lane) were probed with HIF1 α-specific antibody that identified several bands. As positive control we loaded protein nuclear extract form HeLa cells exposed to desferrioxamine (DFO) (0.1 mM for 24 hours) which allows discrimination of a specific band at about 120 kDa, which we considered as corresponding to HIFte protein. For both HIFs, Lamin A and α-Tubulin were used as internal standard for nuclear extract and cytosolic extract, respectively. Chronic exposure to low oxygen tension induces a wide range of pathways that are principally orchestrated by the transcription factors HIFs that, due to their very short half-life (Textoris, 2012), are considered as immediate surrogate markers of the status of the cellular oxygenation. If in normoxia HIF protein presents a very fast decline of its expression, it appears to be interesting to evaluate how long hypoxia-sensitive gene transcripts are stable and maintain their level of variation induced by chronic hypoxia stimulus. In order to estimate how the expression profile of our selected genes and their proteins may be affected by a very brief recovery to normoxia, we analyzed the level of mRNA and proteins in samples obtained from animals sacrificed immediately at the end of chronic hypoxia period, and from animals sacrificed after 10 minutes in which they were allowed to re-oxygenate in normoxia. More precisely, the lungs of individuals were collected within 5 (HYP5) or 15 minutes (HYP15) from the end of exposure to 10% O2. Five minutes is the shortest time in which we were able to sacrifice the animal, collect the samples and freeze them in liquid nitrogen. For each gene, the averaged value representing its expression level was normalized to the averaged value obtained for the same gene in the normoxic CTRL group; in this way, the result is an indication of how many times (fold) hypoxia has modified the expression compared to the normoxic situation. The same approach was used to represent the protein levels. As shown in Figure 2A, hypoxia induced a significant increase of about 90% of HIFte mRNA (1.90±0.49-fold, p<0.01) relative to CTRL, which was reduced to only 30% after re-oxygenation (1.28±0.07-fold relative to CTRL, p<0.01). HIF2α; mRNA was reduced by approximately 30% during chronic hypoxia (0.72±0.11-fold relative to CTRL, p<0.01) and about 20% further after recovery (0.58±0.15-fold relative to CTRL, p<0.01) (Fig.2A). 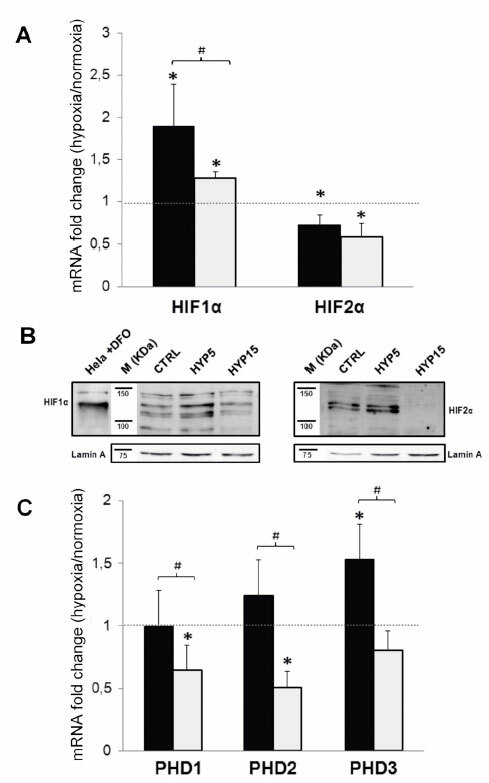 Comparing with the absolute value, despite this hypoxia-induced decrease the mRNA level of HIF2α; in the lung always remained higher than that of HIFte. Figure 2. Change in the expression level of selected transcripts and proteins upon hypoxia exposure (HYP5) and after short recovery in normoxia (HYP15). Panel A. The results of quantitative real-time RT-PCR were normalized to the corresponding 18S rRNA and reported as the fold change of hypoxic samples compared to normoxic ones (dashed line). HYP5 (blackbars) represent the averaged data obtained for the specific mRNA in rats immediately sacrificed at the end of the hypoxic period, while HYP15 (graybars) refer to mRNA from samples obtained after 15 minutes of recovery to normoxia. Data are detailed in the text and are presented as mean of °/o ± coefficient of variation. Statistical analysis relative to control and between the groups was set at p<0.01 and indicated in the histograms by the symbols * and # respectively. Panel B. 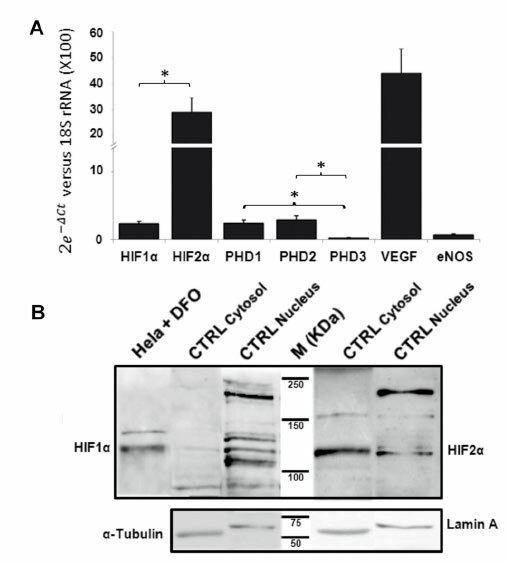 Representative Western Blot analyses of HIFte (left) and HIF2α (right) protein expression in the nuclear fraction of CTRL, HYP5 and HYP15 lungs. Panel C. The bar graph represents the quantitative realtime RT-PCR results obtained for the three isoforms of PHD in HYP5 (black bars) and HYP15 (gray bars) compared to CTRL. Statistical significance relative to the control and between the groups was set at p<0.01 and indicated in the histograms by the symbols * and # respectively. Since HIFs exert their functional role in the nucleus, we first considered their protein levels in the nuclear fraction of the tissue lysate (Fig. 2B). HIFte remained stable (1.62±0.5; 1.28±0.5 and 2.10±1.4 in CTRL, HYP5 and HYP15, respectively) as well as HIF2α; in the HYP5 group (1.16-fold), while this last decreased about tenfold in the HYP15 samples compared to the CTRL baseline (0.28±0.09, 0.24±0.19 and 0.03±0.02 in CTRL, HYP5 and HYP15, respectively). In the cytosolic tissue fraction, the latter protein remained fairly constant (data not shown). With respect to PHDs (Fig. 2C) after lowering O2, only PHD3 significantly increased its expression (1.5±0.28-fold relative to CTRL, p<0.01), while the other isoforms remained unchanged compared to their normoxia levels. Fifteen minutes of re-oxygenation induced a significant reduction of the PHD1 and PHD2 transcripts: about 35% (0.65±0.19-fold relative to CTRL, p<0.01) and 50% (0.50±0.13-fold relative to CTRL, p<0.01), respectively, as well as of PHD3, which returned to the basal condition. Figure 3A shows that the relative expression of VEGF was steady after chronic hypoxia, and slightly decreased by about 20% during recovery (0.80±0.36-fold relative to CTRL). By contrast, eNOS was significantly reduced overall with a greater difference found for the samples processed within 5 minutes. In HYP5 the transcript reached 30% of the basal level (0.30±0-37-fold relative to CTRL, p<0.01) while in HYP15 it doubled (0.58±0.27-fold relative to CTRL, p<0.01). The protein level of these last two targets was evaluated only in the cytosolic fraction of the tissue lysate, since this is their functional location. While for VEGF we detected a steady level of the protein (0.05±0.01; 0.07±0.02 and 0.06±0.01 in CTRL, HYP5 and HYP15, respectively) (Fig. 3B), we were not able to detect any phospho-eNOS, which is the functional form of the protein, probably due to its low level of expression (data not shown). Figure 3. Change in the expression level of VEGF and eNOS transcripts and proteins upon hypoxia exposure (HYP5) and after short recovery in normoxia (HYP15). Panel A represents the results of quantitative real-time RT-PCR normalized to the corresponding 18S rRNA and reported as the fold change of hypoxic samples compared to normoxic ones (HYP5, black bars and HYP15, empty bars). Statistical significance relative to the control was set at p<0.01 and indicated in the histograms by the symbol *. Panel B. Representative Western Blot analyses of VEGF protein expression in the cytosolic fraction of CTRL, HYP5 and HYP15 lungs. The turnover of mRNA is extremely important for the homeostasis of cells, and in general for organisms, because it allows the fine regulation of a wide variety of transcripts relevant for physiological functions. Moreover, it enables the tissues to tune rapidly the response to changes in extrinsic stimuli, such as those present in the local environment. The time course of the up-regulation of genes in hypoxia is widely studied, but few data are available for the in vivo time dependence decay of the mRNA level during recovery to normoxia. We believe that this kinetics is of interest, especially if we consider not only people returning from high altitude expeditions, but also people recovering from disease conditions (reperfusion after ischemia or improvement from pulmonary hypertension). We learned at our expense (struggling in the recent past to have reproducible data) that in this kind of study many different technical parameters need a tight control, and moreover that the delay between the end of the hypoxic period and the sacrifice of the animal is crucial, even if it is a matter of a minute. Moreover, after the sacrifice there is another factor that must be considered: the mRNA of both target and housekeeping genes in a dead body degrades during the post-mortem interval. Based on the literature (Zhao, 2006), we calculated that within the first hour after death one can extrapolate 10% degradation of the total lung mRNA, thus we considered the limit of five minutes necessary for us to process the samples to be a safe interval to work with. The mRNA of inducible genes such as the hypoxia-sensitive ones is known to be less stable in-vitro than that of constitutively expressed genes. Moreover, in the rates of mRNA degradation (decay) of different human cell lines (Yang, 2003) , a small percentage (-5%) of expressed transcripts was found to have "fast" decay rates (half-life < 2 h) and among these were the transcription-related transcripts. This may be the case for HIFs, and in the second instance, of the HIF-dependent transcripts. Therefore, it might be expected that, since these genes present a rapid increase in transcription upon hypoxia exposure, they may have a fast decay in their level as well with the return to normoxic condition. For this reason, the goal of our work was to produce a frozen picture of the potentials of the lung tissue in hypoxia as well as after a very brief recovery in normoxia. We believe that the mRNA analysis may be very representative of this aim. In fact, transcription is the closest step to the sensing of a change; moreover, any variation in the mRNA level may, in the very near future, be decoded into a variation in protein translation and ultimately in tissue function. Of course we also evaluated the protein level, but as the results show, when looking for whole tissue responses to an environmental change this approach was less sensitive and more subject to inter-individual heterogeneity, as the high degree of variation suggests. This high variability may also be explained by the consideration that lungs as a whole are composed of many different cell types (the principal being endothelial, epithelial, macrophages and smooth muscle cells), and for each of them proteins have mechanisms of stabilization or degradation that may be very specific. (Burke, 2002; Talks, 2000; Galbán, 2009, Bárdos, 2005; Feldser, 2009; Agani, 2000). For clarity we now discuss the targets studied separately. Our data collected from CTRL samples showed that in the rat lung HIF2α; mRNA is much more expressed (14 fold) than HIFte. At the protein level we found that in the nucleus, where HIFs exert their functional role, HIFte was predominant compared to HIF2α;, but still this latter is highly represented in the cytosolic fraction of the lung lysate, much more than the 1α isoform. This is in line with the literature, where it is reported that while HIFte is ubiquitously expressed, HIF2α; has more limited tissue distribution with prevalence in tissues regulating oxygen delivery such as endothelial cells and lung type II pneumocytes (Wiesener, 2003). Moreover, lung normal tissue (non-tumor) macrophages and hypoxic lung macrophages accumulate HIF2α; rather than HIFte, and its expression is higher in the cytoplasm than in the nucleus (Burke, 2002; Talks, 2000). Indeed, lungs are enriched in both these types of cells. Overall our data also suggest that in normoxia HIF2α; is the most relevant isoform of HIF, important for the regulation of the lung homeostasis. Comparing the mRNA levels of the HIF and PHD mRNAs, our results are also in line with those of Appelhoff (Appelhoff, 2004) , indicating that probably PHD3 is important for the regulation of HIF2α; in the whole lung tissue, since a low level of mRNA of the regulator protein is paralleled by the high level of the mRNA of the transcription factor. Upon chronic hypoxia exposure we found that HIFte mRNA, but not HIF2α;, was indeed overexpressed in the samples obtained from group HYP5, becoming in relative terms the predominant isoform responsible for tissue response and the more sensitive to the O2 reduction. Of course, since our interest is related to the lung tissue, we cannot exclude tissue specificity in the response (Wiesener, 2003). Nevertheless, this result may be explained by the stabilization of HIFte mRNA in hypoxia (Lang, 2002; Görlach, 2000). When the hypoxic stimulus disappears, HIFte mRNA is no longer stabilized, which supports our results showing that in fifteen minutes of recovery to normoxia the tissue lost about 67% of HIFte mRNA expression, which, as a trend, represents a very fast kinetics of decay. In fact, assuming a linear degradation rate from our data, the half-life of HIFte mRNA is 22 minutes. Similar results were already reported in a monolayer cell culture study, where the half-life of HIFte mRNA was 10 minutes (Prabhakar and Semenza, 2012). In fact, if we consider a simple system we could speculate that following a decrease on O2 tension, a high level of HIFte mRNA produces a high level of HIFte protein that may remain steady and exert its function because it is not counterbalanced by a sufficiently high level of PHD2, since its mRNA level remained low in hypoxia. Unfortunately, the system is not that simple, as well reviewed by Galbán and Gorospe (Galbán, 2009). For HIFte, the protein expression level is the result of complex regulation at transcriptional, post-transcriptional, translational and post-translational levels. Nowadays, we know that a number of additional regulatory mechanisms appear to operate to determine the final protein concentration, some of which fall outside the canonical degradation pathway, such as protein-protein interaction, trophic stimuli and reactive oxygen species (Bárdos, 2005; Feldser, 2009; Agani, 2000). A possible role for hypoxia-induced microRNAs may be one of the reasons why we did not detect an increase of the HIFte at the protein level (Bruning, 2011; Kelly, 2011; Chan, 2010). A second reason may be related again to the complex composition of the lung tissue with several cell types that may have different HIF regulation. In A549 epithelial cells an acute hypoxia exposure produces an increase in HIF1α protein level, but prolonged exposure to low oxygen tension failed to demonstrate HIFte protein accumulation, probably due to a negative feedback regulation that decreased its mRNA stability. In contrast, HIF2α; protein stimulation remained stable also upon prolonged hypoxia, probably due to transcriptional activation rather than to a change in mRNA stability. In smooth muscle cells, another constituent of the lung tissue, in prolonged hypoxia endothelin-1 induces HIFte synthesis and reduces PHD2-dependent down-regulation (Pisarcik, 2013) and angiotensin II and thrombin increase HIF1α stability, as mediators of the regulation at transcriptional and translational levels (Page', 2008). In general terms, we note that all the HIF and PHD mRNAs considered in this paper presented a very rapid decay upon re-oxygenation. This represents a novelty that may deserve to be investigated in detail by more appropriate studies. We believe that pathways responsible for mRNA degradation and/ or impairment of transcript stability could explain our new finding. One of the most important adaptations in chronic hypoxia is angiogenesis, a process that involves the growth of new blood vessels from preexisting ones, in order to provide blood supply and subsequent oxygen and nutrient delivery to deficient tissues. In these conditions, angiogenesis is mainly determined by HIF-dependent transcription of VEGF (Shweiki, 1992). It has already been demonstrated that in-vitro the mRNA level of VEGF increased up to 12 fold, and besides being more transcribed, it is also stabilized post-transcriptionally (Levy, 1995). Thus, it might be surprising that in our results we did not find a hypoxia-dependent increase in VEGF mRNA, despite the fact that it has been reported that prolonged exposure to hypoxia eventually down-regulates transcriptional activation of VEGF (Kuo, 1999; Olfert, 2001). Again, we may argue that we are working with the lung as a whole organ. In our previous paper (Rivolta, 2011), we observed a remarkable heterogeneity in the lung response to hypoxia in terms of perfusion control, allowing blood flow distribution to lung regions that still retained diffusion properties, thus adapted to hypoxia, and reducing it in the areas where the typical features of a good diffuser are lost. Thus we believe that the results we obtained here represent an average of the whole tissue condition, and this is also reflected in the high coefficient of variation. Our group is currently working to verify this hypothesis by analyzing the expression level of VEGF in different regions of the lung exposed to chronic hypoxia. In terms of VEGF protein, we did not detect any significant difference among the normoxic and hypoxic rats. 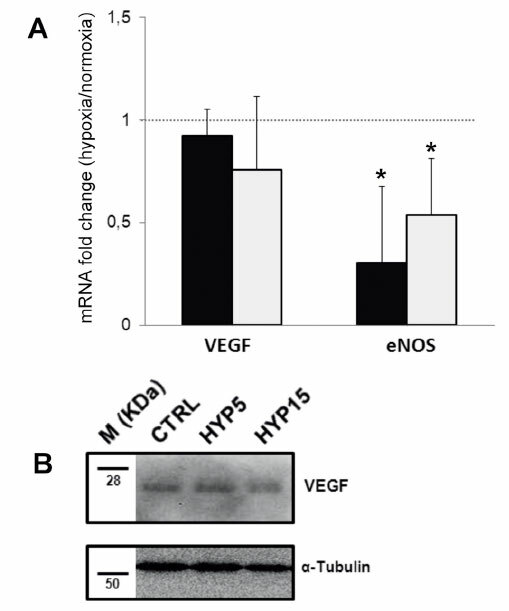 The expression level of eNOS is crucial for the production of nitric oxide in endothelial cells. Our results confirm previous data in which after chronic hypoxia the decrease in eNOS mRNA was explained by a down-regulation at transcriptional and post-transcriptional levels (McQuillan, 1994; Ho, 2012) with a shortening of the eNOS mRNA half-life. Not all studies are in agreement, but one should notice that our data show almost a doubling in the level of eNOS mRNA after only 15 minutes of recovery in normoxia. We thus hypothesize that in these experiments timing plays a crucial role. The reason why eNOS is down-regulated in hypoxia may be explained, again, by the presence of areas of the lung where perfusion is highly reduced. The reduction of blood flow by itself reduces eNOS mRNA (Le Cras, 1998), and less blood means also low oxygen tension, in a combination of microenvironmental conditions that leads in a single direction a decrease in eNOS expression. Probably, the degree of the reduction parallels the degree of extension of the region of the lungs that does not diffuse any more. Again this is an interesting point to address in the near future. We presented in this paper the possibility to detect in a whole lung tissue sample the mRNA of HIFte, HIF2α;, the three isoforms of PHD, VEGF and eNOS. We show for the first time that in normoxia, despite the prevalence of HIF2α; mRNA, in the nuclear extract the HIFte protein is predominant, while in the cytosolic fraction it is hardly detectable and HIF2α; is highly present. Among the three PHD isoforms the PHD3 mRNA is the most abundant, while eNOS mRNA transcripts appear to be very few. In hypoxia, instead, it is the HIFte which is up-regulated, even though this is hard to discriminate at the protein level, while the HIF2α; protein presents a very rapid decay upon re-oxygenation. We did not find hypoxia-dependent significant differences in the mRNA and protein level for VEGF, while eNOS messenger was decreased in hypoxia and the normoxic stimulus up-regulated it. We believe that the biological relevance of this paper relies in part in the consideration that when dealing with the whole organ instead of monolayer cells, the response to certain stimuli may be somewhat different since the organ is the ensemble of different cell types that may react differently to the same challenge. Moreover, the recovery from hypoxia exhibits a very rapid kinetics of decay, both for mRNAs and for proteins responding to O2 concentration. We take our results as an opportunity to suggest to other researchers to be very careful in analyzing the time-dependence of recovery from hypoxia. This work was funded by an institutional grant (Fondo di Ateneo per la Ricerca, Università Milano-Bicocca). The authors thank the fellows of the laboratory of Prof. DiFrancesco D. (University of Milano) for technical help and hospitality and the laboratory of Strazzabosco M. (University of Milano Bicocca) for assistance. PISARCIK S, MAYLOR J, LU W, YUN X, UNDEM C, SYLVESTER JT, SEMENZA GL, SHIMODA LA (2013). Activation of Hypoxia-Inducible Factor-1 in Pulmonary Arterial Smooth Muscle Cells by Endothelin-1. Am J Physiol Lung Cell Mol Physiol. [Epub ahead of print] [ Links ].